Plants on the Deer Springs Trail, 21 October 2006, 8160 feet elevation. 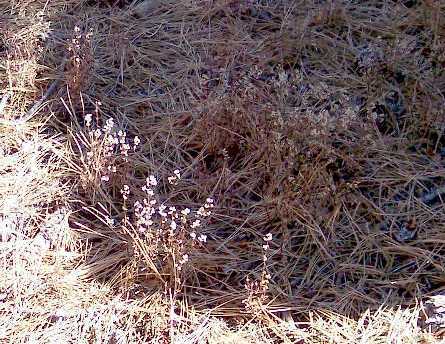 Upper portion of single, unbranched stems from the Deer Springs Trail, 10 October 2006, 8160 feet elevation. 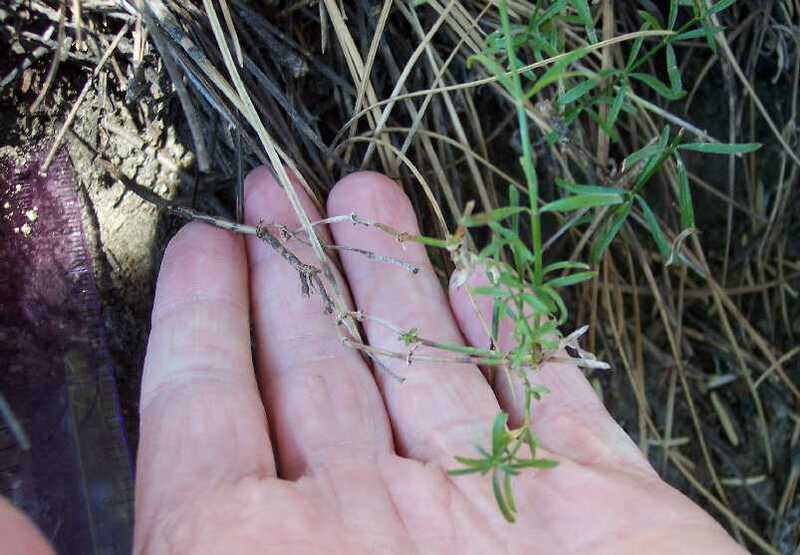 Upper portion of dried stems from Lake Fulmor, 19 July 2006, 5400 feet elevation (see picture of these specimens in the field). For an excellent description of coming across this species in the field for the first time, see Michael Charters' report. The existence of the rhizome was obvious in the field even without digging up the soil to expose the rhizome since the plants are quite-uniformly distant from each other, with many in straight lines, as seen in the pictures above. This rhizome was conveniently already exposed on the cut bank just above the trail. It is emerging from the soil just below the litter on top of the soil, just above the corner of the ruler at upper left. I measured nodal distances of 20-32 mm on the single exposed rhizome. Nearby plants were separated above ground at their bases by 15-55 mm, quite well-spaced. The rhizome is also apparent in online voucher photographs such as this Lake Fulmor voucher, which shows how the single stem off the rhizome becomes multiple-branched above-ground with age. Galium angustifolium is said to have stems that are woody at least at base. This trait is a little confusing for ssp. jacinticum, since the first stems produced by the rhizome are not woody at all, and the woody portion may be below ground even for more mature stems (see pictures above). In fact, one reference quotes Dempster and Stebbins (1971) as saying that ssp. jacinticum does not have woody stems. However, it looks like eventually the base of the stem does become woody. Microscopic view of lower side of dried corolla from Deer Springs Trail, 10 October 2006, 8160 feet elevation. G. angustifolium ssp. jacinticum, found only at SnJt, seems very similar to G. johnstonii, found only in SnGb and SnBr. The most reliable differences seem to be that for G. johnstonii, the pedicels are longer than the fruit, and the fruit hairs are shorter than the fruit, whereas in G.a. ssp. jacinticum, the pedicels are generally shorter than the fruit and the fruit hairs are longer than the fruit. Many plants of G. johnstonii have upper stem nodes much longer than lower stem nodes, as in this voucher, but this voucher from the SnGb shows that this is not always the case. The other distinguishing feature in the Munz key, leaves congested at base or not, seems not to be reliable, and is not mentioned as a distinguishing characteristic in the Jepson Manual treatment. All mature specimens seem to have leaves congested at the base, due to the many branches eventually produced from the original stem. Online vouchers are all in correspondence with the geographic separation, except for a single online voucher from SnJt, smack in the middle of the G.a. ssp. jacinticum population, determined as G. johnstonii. Perhaps the determination of that voucher ought to be revisited, or perhaps the separation of those species ought to be revisited. I have yet to see any examples of G. johnstonii, or this voucher, so I cannot comment personally here. G. johnstonii used to be known as G. angustifolium ssp. pinetorum. It seems surprising to treat it as a separate species and at the same time keep G. angustifolium ssp. jacinticum as a subspecies of G. angustifolium. This is especially true since G. angustifolium ssp. jacinticum has a different chromosome number from the other G. angustifolium subspecies, but the same number as G. johnstonii. Apparently, Dempster and Stebbins (1971) felt the difference in the corolla hairs was enough to make G. johnstonii a separate species. 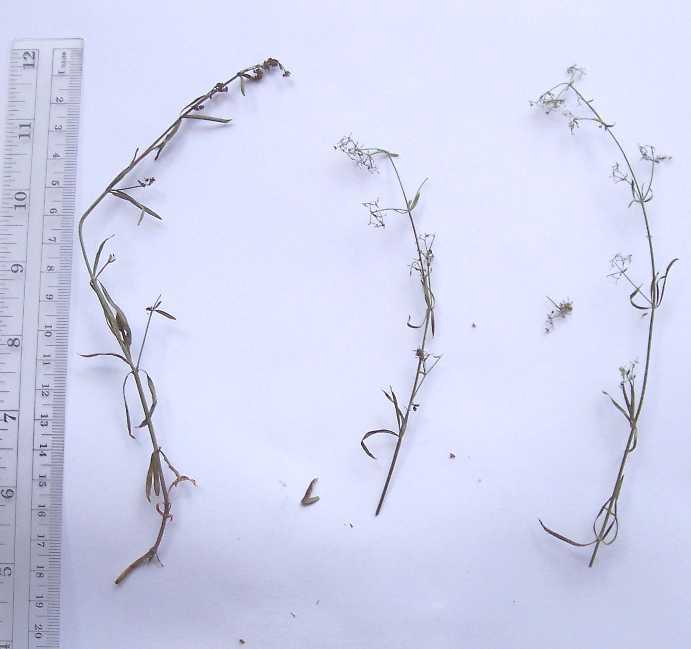 But given the variability in the corolla hairs for G. angustifolium ssp. jacinticum, the relative taxonomic level for these two taxons perhaps ought to be revisited. 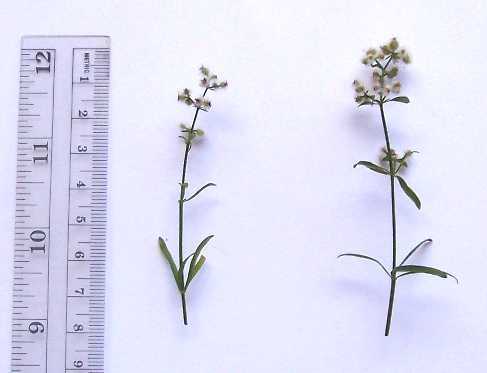 The stems are ridged in Galium angustifolium, and the Jepson Manual mentions for each subspecies whether the ridges are narrower than the flat surfaces between the ridges, or whether they are about as wide. These properties vary widely in fresh specimens. I've examined dozens, perhaps hundreds, of specimens of ssp. angustifolium for this trait and found a wide range in ridge properties. The number of ridges varies from four to eight. When the number of ridges is four, there are wide flat surfaces between the ridges. When the number of ridges increases to eight, the new ridges occur in the middle of the former flat surface. Hence the flat surface is reduced in width by more than a factor of two, and becomes roughly comparable in width to the ridges. The two sets of specimens I've examined for ssp. jacinticum have four very narrow ridges on each stem, contrary to the stated ridges ± as wide as surfaces between. However, one of the vouchers does indeed state on the label that it has wide stem ridges (SD160230). Microscopic view of stem from Deer Springs Trail, 10 October 2006, 8160 feet elevation. A flat portion of the stem is facing the camera, with the ridges a bit out of focus on the sides. 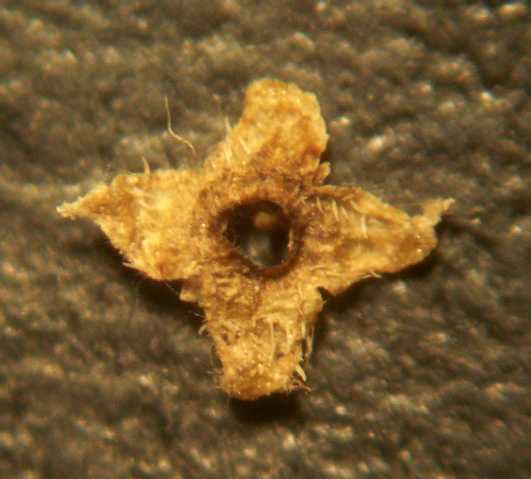 Both stems appear similar when viewed under the microscope by eye, as having four sharp ridges with a broad flat area in between. The picture of the Deer Springs Trail specimen clearly shows a very broad flat area with narrow ridges to each side. This is also seen in the Lake Fulmor specimen for the flat area facing to the left above. However, the microscopic view above for the Lake Fulmor stem shows that the flat area that is facing the camera is somewhat curved, and produces a shadow when illuminated from the side. It is possible that dried pressed plants produce what looks like a broad ridge in the center of the flat area, making eight "ridges" and eight flat areas, both approximately of the same width. Nonetheless, those broad "ridges" are very different from the four very sharp narrow ridges, and very different from the eight narrow ridges I've seen in some specimens of ssp. angustifolium. The sharpness of the ridge can be seen most clearly at bottom left for the Lake Fulmor stem; the ridge appears to be less sharp above that because the stem has a slight twist, making the ridge partially face-on above the bottom left, where it is edge-on to the camera. Ssp. 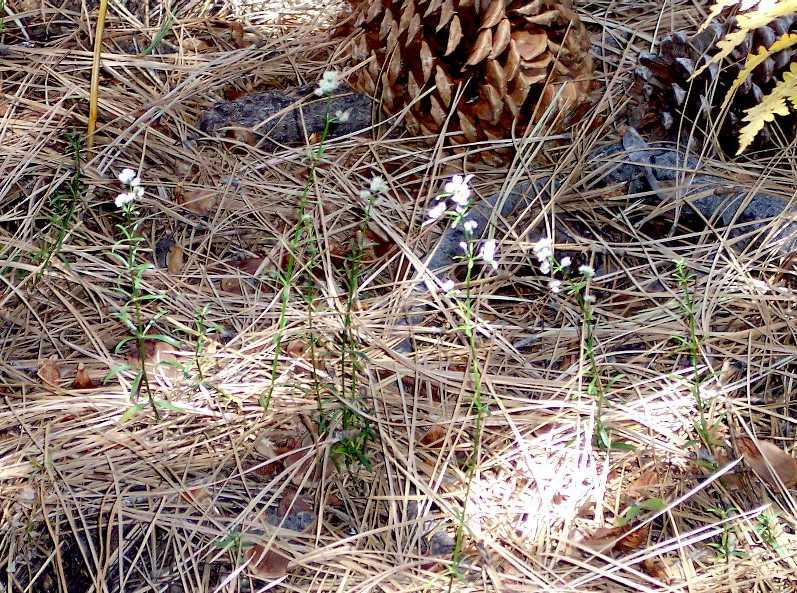 jacinticum has been thought to be endemic to the San Jacinto Mountains at fairly low elevations. Munz said Largely Yellow Pine Forest, 4200-6500 feet, west side of San Jacinto Mountains. The Jepson Manual gives essentially the same locations, 1350-2100 m. w SnJt, which corresponds to 4400-6900 feet. Even the Western Riverside County Multiple Species Habitat Conservation Plan, written no earlier than 2001, gives this same range. This distribution has always seemed a bit curious to me, as it is hard to understand why this taxon was confined to mid-elevations only on the west side. It wasn't clear to me what made that location a unique habitat. But there are many endemic species whose confinement to a given location isn't well-understood. However, in this case, it turns out that ssp. jacinticum is actually a much more widespread taxon. Since the time of the Jepson Manual, ssp. jacinticum has been vouchered as far as 81 miles away, significantly extending its range to the south and east! Craig Reiser vouchered it from the Santa Rosa Mountains in Riverside County in 1993 and from the Volcan Mountains in north San Diego County in 1997, and then Jeannie Gregory vouchered it from the Boulevard area of south San Diego County in 2004. Furthermore, a voucher by Harvey Monroe Hall, from 1901, from Tamarack Valley is now determined as ssp. jacinticum. (That voucher has had its determination changed five times!) The elevation in the online record is given as 8000 feet, but Tamarack Valley is entirely above ~8500 feet, significantly extending the upper elevation range as well. Important caveat: I have not looked at these vouchers made by others personally, and so am relying on the determinations made by others. I plan to examine the vouchers from the areas outside the west San Jacinto Mountains in the future. On 6 December 2006, I found a population on the upper Sawmill Trail in the Santa Rosa Mountains. This location is between, and close to, the vouchers near Pinyon Flats and on the Santa Rosa Mountains ridgeline, and hence confirms that this taxon indeed is in that locality. On 10 October 2006, Dave Stith and I discovered and vouchered a population on the Deer Springs Trail at ~8160 feet (2490 m), confirming that there are populations at such high elevation. That discovery motivated me to collect the information on the current range of ssp. jacinticum. The following plots show the latest information on the range of ssp. jacinticum. All plotted locations come from vouchered specimens. All of the vouchers except the 10 October 2006 specimen were obtained from the Consortium of California Herbaria on 19 October 2006. Of course, many of the voucher locations are not precise, so some locations such as Garner Valley have large uncertainties. I suspect the heavy concentration of vouchers to the w SnJt area has a lot to do with that area being easily accessible by many roads, as well as by expectations of finding this taxon there. Further surveys may find more examples of this taxon in other areas.